Are you looking for a fun outdoor activity for you and your family? Stand up paddle boarding is the fastest growing water sport in the world and is a great activity for you and your children. Perhaps you already are a paddle boarding mom or dad. Chances are your kids will see you paddle boarding and want to join in the fun. First they’ll ride with you on the board, but pretty soon they’ll want to hold the paddle themselves. Whether your child is is natural to sport or not, stand-up paddling is enjoyed by children of all ages and the benefits are numerous. 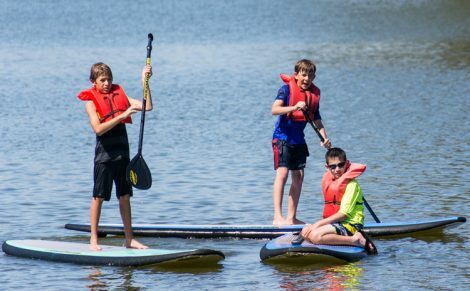 Not only is paddle boarding extremely fun to do by themselves or with friends but it also gets them in the fresh air, helps to build their water confidence plus many great healthy benefits by getting kids active. Most youngsters also enjoy a bit of competition, as it gives them a purpose and a sense of achievement. As a new skill learning to paddle board does take some practice, but once they are comfortable on the board and on the water they should learn the basics fairly quickly. 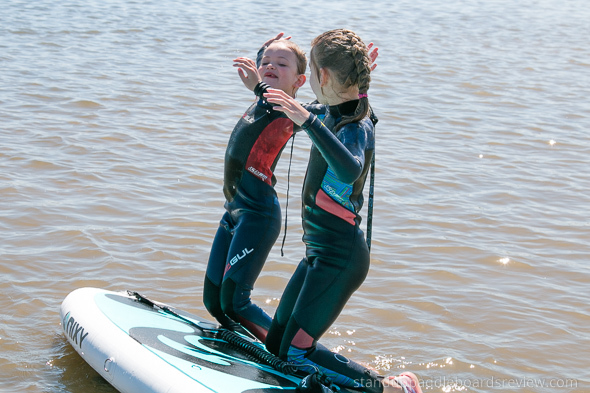 Steps to teaching your kids stand up paddle board safely. 1. Your child must know how to swim and wear a life vest. Before your child can participate in any watersport he or she needs to be able to swim, and be comfortable in and on the water. Your child should also wear a life vest. Safety always comes first! For the same reason, until your children are experienced paddle boarders and you are satisfied they understand the inherent dangers in a water activity, you or another adult should keep an eye on them. Beter yet, why not be on the water on another paddle board beside them and join in the fun. 2. A paddle board leash is essential. A paddle board leash is attached to the paddle board and to your child’s ankle. If your child falls in the water, the leash will make sure they are not separated from their board. 3. Give your child a kid-length paddle. Most adult sized paddles are too long for children. Either adapt one of your paddles to their height and strength or get a smaller canoe paddle for your child to use. 4. Let you child start off kneeling on the board. Place your child in the center of the board, or hold the board while your child climbs on. Have them start out paddling in a kneeling position, getting a feel for the board and the water. Only after they are comfortable in this position, encourage your kids to stand up on the board and paddle. Also start out on flat calm water. Choose a sheltered location without waves, current, or motorboats, that is not too busy. This will not only help keep the board more stable but there will be less distractions as well. Once your child is comfortable on the board, try to teach the basics of paddling such as: paddling evenly, turning, falling and jumping off the board, and getting back on the board in deep water. Teaching your kids stand up paddle boarding is great fun for you and your children. Encourage them and let them enjoy themselves. Share in their excitement. And sit back and watch with pride as you now have the makings of a lifelong paddler!